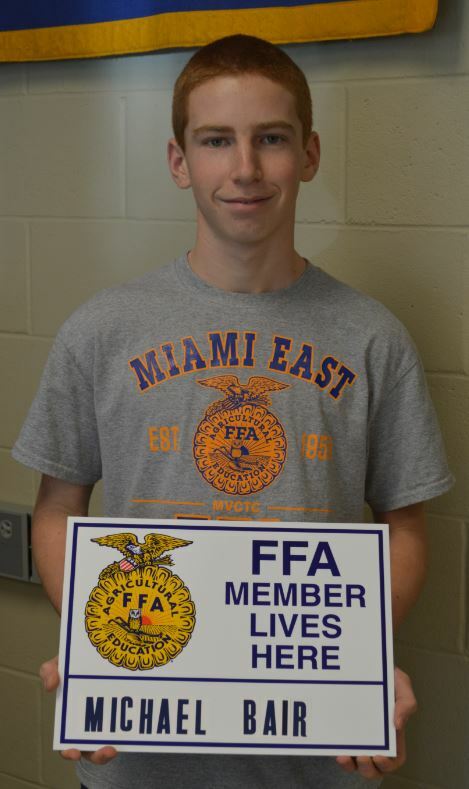 The January 2017 Miami East-MVCTC FFA Member of the Month is Michael Bair. Michael is the son of David and Annette Bair of Troy. Michael is a freshman at Miami East High School and a first year agriculture student enrolled in Agriculture, Food, and Natural Resources. Michael was chosen for his recent accomplishment of earning a $1,000 National FFA Supervised Agriculture Experience Grant from CCOF Foundation for organic agriculture. Michael has his own business of raising pasture-raised, organic market chickens. Additionally, Michael has participated in the county FFA Parliamentary Procedures Career Development Event as the team’s chairperson. Michael has also participated in the Farm Safety Week’s Drive-Your-Tractor-To-School and Corn Challenge. Every month of the school year the Miami East-MVCTC FFA will select a student to be the FFA Member of the Month. The officer team will nominate one student that has been actively involved in the FFA chapter, school and community activities. Two $1,000 grants have been awarded to Miami East-MVCTC FFA members Michael Bair and Maci Krites by the National FFA Organization. The SAE Grant is designed to help FFA members create and enhance their Supervised Agricultural Experience (SAE), a requirement that all FFA members must complete. 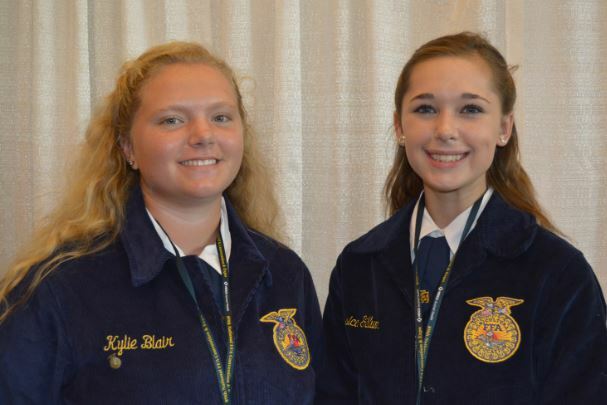 Both Bair and Krites are members of the Miami East-MVCTC FFA Chapter and were selected as recipients of only 149 grants out of almost 2,600 applicants nationwide. 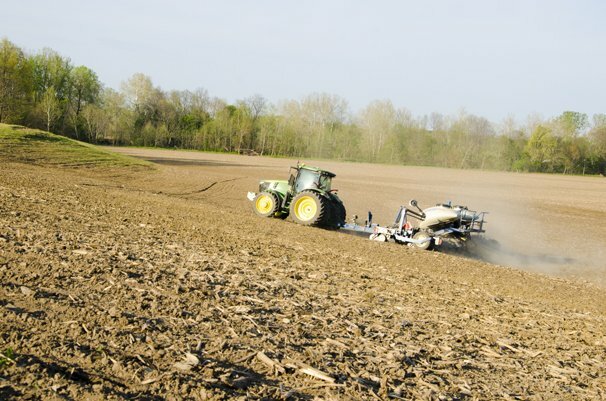 An SAE requires FFA members to create and operate an agriculture-related business, work at an agriculture-related business or conduct an agricultural research experience. Upon completion of the grant fiscal year, grant recipients must submit a comprehensive report regarding their career development experience. Michael Bair is the son of David and Annette Bair. He received a $1,000 grant from the CCOF Certified Organic Foundation. Bair will use the grant monies to develop his own pasture raised chickens. He will purchase a meat cooler to store harvested chickens until customers are able to purchase the product. Anthony Wayne FFA member Maggie Burkett recently received a $1000 grant from the National FFA Organization for her supervised agricultural experience (SAE). 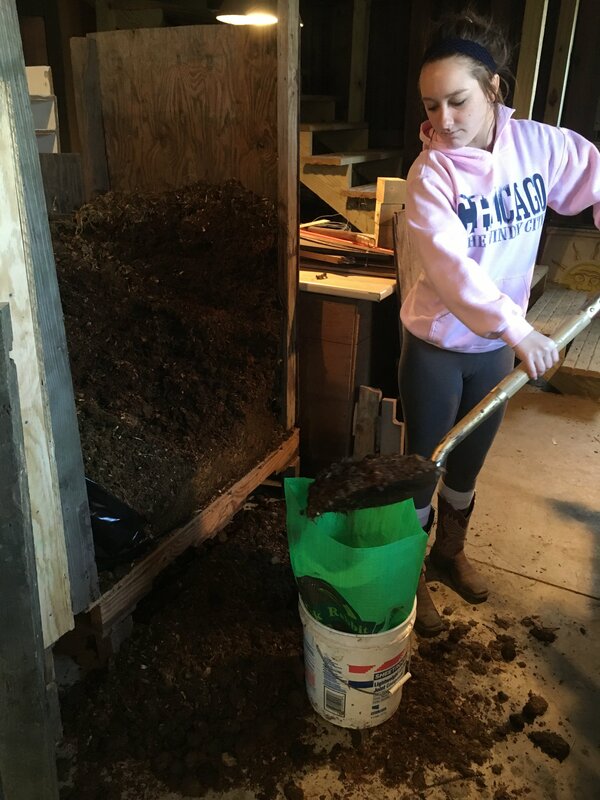 In her SAE, Maggie uses the manure from two horses she owns and composts it. The manure composts in large pallets that are 5’ tall and 4’ wide during the winter. When the manure is finished composting, Maggie packs it into 10 pound bags and sells them for $2 each in the spring. She has multiple customers who have requested that she continues this business because they like using the natural fertilizer for their gardens. She began this SAE in the winter of 2015, which was when she began taking an agriculture course at Anthony Wayne High School. With the grant that she received, Maggie plans to purchase a Stall Butler. This will help her to separate the manure more efficiently than she can by hand, make it more organic, and expand her business throughout her years in FFA. Leadership and potential, these are two words with many meanings. On Thursday, December 1st, at the Shelby FFA Leadership Night, 132 FFA members from 8 different chapters learned what these words are all about. 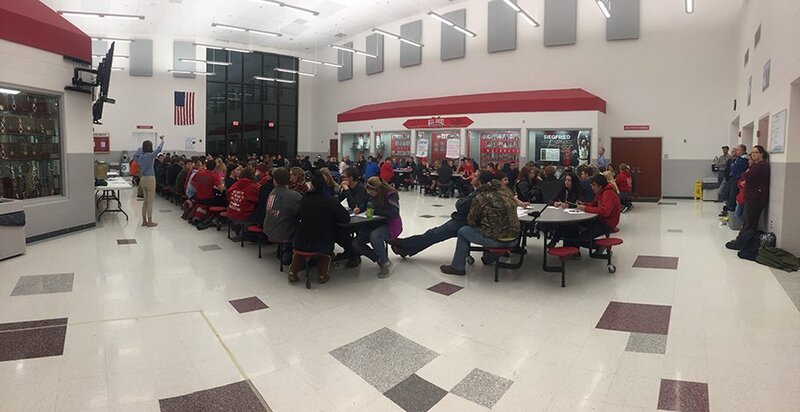 The night was kicked off at 6 p.m. with a pre-session meet and greet mixer put on by the Shelby FFA Officer Team. During the meet and greet, FFA members were all given a paper with multiple questions such as, “Find someone who has shown at the Ohio State Fair.” or “Find someone who has received their State FFA degree.” The members then had to find a member from a different school who fit the question, and have them sign under the statement. The leadership session was then presented by three of the Ohio FFA State Officers, Meredith Oglesby, vice president, Evan Smith, treasurer, and Johnathon Cottingim, sentinel. Within the program, the state officers put together games, questions, and challenges to teach members not only what potential means, but also how we can use our potential to make a difference. 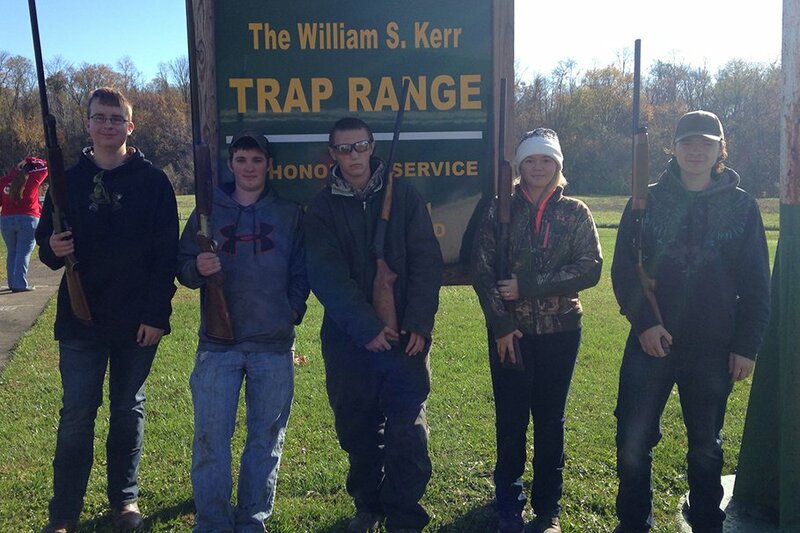 The Hiland FFA participates each year in the Trapshoot Contest. The contest is where the contestants use shotguns to hit clay pigeons that have been thrown in the air. This year the contest was held at Columbus and the Hiland FFA Trapshoot Team saw one place 11th and team two placed 12th. The contestants were split up randomly. The members that took part in this contest included: Carson Feikert, Bailey Engstrom, Marlin Hershberger, Kyle Huprich, Ryan Mast, Violet Miller, Tanner Neuenschwander, Parker Stutzman, Miguel Tapia, and Tallie Troyer. The National Trail-MVCTC FFA Chapters Advanced and Novice parliamentary procedure teams recently competed in the districts parliamentary procedure CDE contest at National Trail High School. The advanced team includes Mallory Nugent, Gracie Jones, Hunter Lee, Lily Carpenter, Erika Gallaher, Rachael Kimball and Macel Stowers. The novice team includes Raven Tout, Taylor Davis, Austin Knapp, Abbey Rodefer. Noah Phillips, Ricky Cole, Mark Armstrong, Trena Caldwell and Lila Pegg. The chapter is very proud of the team’s results and all the hard work they put into the preparation for this event as they now are state bound. This CDE requires FFA members to conduct a business meeting using parliamentary law according to the guidelines outlined in Robert’s Rules of Order. FFA members are also tested on their knowledge of parliamentary law. They are graded based on public speaking, official dress, completeness and accuracy, format of the secretary’s minutes, grammar, style and legibility. The two teams performed well during the sub districts contest as well at Eaton High School. Recently members of the Miami East-MVCTC FFA Chapter recently participated in the 2015 FFA County and District Novice Parliamentary Procedure Career Development Events. The County Competition was hosted at Miami East High School and the District competition was hosted at National Trail High School. Participating was Novice Period 4 were team members Chair Anastasia Kilbourne, Vice Chair Kearsten Kirby, Brandi Abner, Kyle Baker, Blaine Brokschmidt, Josie Desautels, Kelsea Drake, Austin Ferryman, Jessica Hicks, Korey Lauck, Kirsten Overholser, Blake Snyder, and Andy Wargo. They earned first place. They advanced to the District Novice Parliamentary Procedures Career Development Event. Participating in Novice Period 5 – Team Blue were team members Chair Chloee Thomas, Vice Chair Savannah Holzen, Elizabeth Bair, Ryan DiNardo, Luke Gilliland, Saige Lacey, Kaitlyn Rohrbach, and Brailyn Tarcea. They received a gold rating. Participating in Novice Period 5 – Team White were team members Chair Michael Bair, Vice Chair Ethin Bendickson, Daniel Baker, Madison Calvert, Megan Honeyman, Thomas Miller, Jesse Nick, Anna Puthoff, and Aliegha Ulsh. The officers broke into groups and taught three different stations. The stations included lessons about, Dairy discovery, Soybeans , and Farm equipment. Each group taught the students about their subject and had an activity to go along with the lesson, and, according to the feedback given, the harvest day was once again a huge success. The Madison-Plains FFA Officers would like to thank the Elementary and Intermediate school for being so cooperative and allowing us to teach the children. Also to the advisors for help with supplies needed to make the day successful. degree attainable in the FFA, the American Degree. 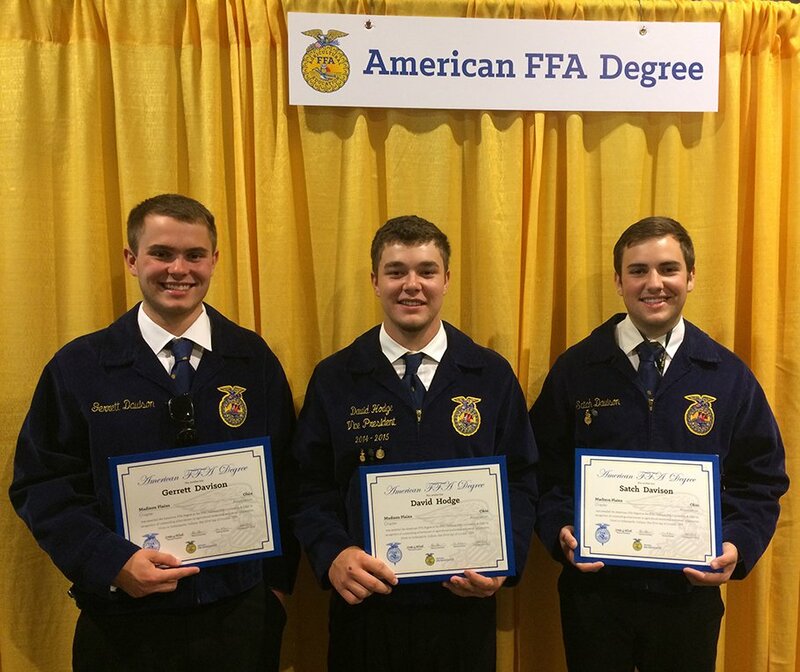 The three were recognized at the 89th annual National FFA Convention in Indianapolis Indiana. The Degree requires the recipients to meet specific extensive requirements. This year’s recipients included Satch Davison, Garrett Davison, David Hodge and Kayla Thornsberry. As part of the requirements to earn their degree, they had to earn over $10,000 in their SAE projects and participate in at least 50 hours of community service. On average, only .5% of the 629,367 members of the National FFA earn the American FFA Degree. This year Madison Plains had 4 of the 3,780 American FFA degree recipients. The Madison-Plains FFA Chapter is very proud to see it’s members go so far and would like to congratulate them on their hard work. These four alumni members give the chapter hope in knowing anything is possible and hard work pays off. 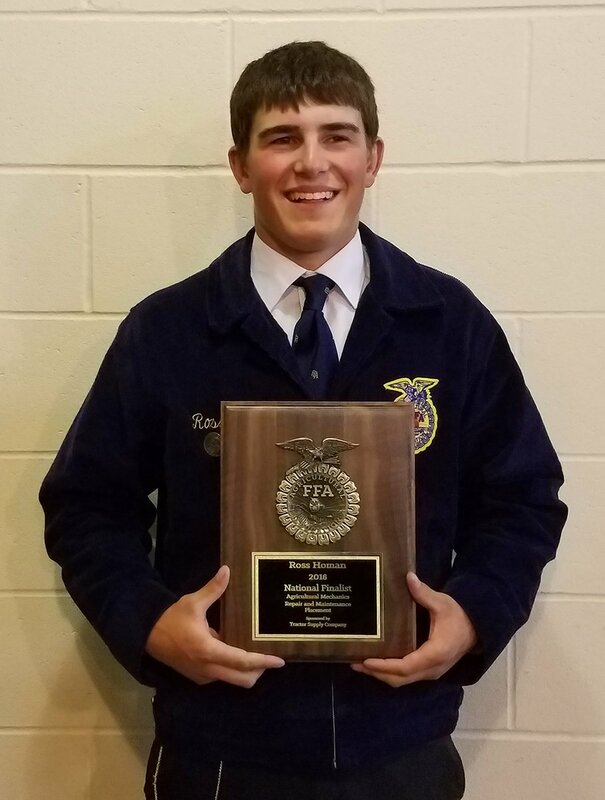 Ross Homan of the Fort Recovery FFA Chapter was selected this past year as a national finalist for the National FFA Proficiency Award in Agricultural Mechanics Repair and Maintenance — Placement. Homan has worked for his father from a very young age. At their tractor sales operation, he has learned all about agricultural equipment maintenance and repair. He’s been charged handling tasks ranging from dock work to lot organization, from assembly to maintenance. 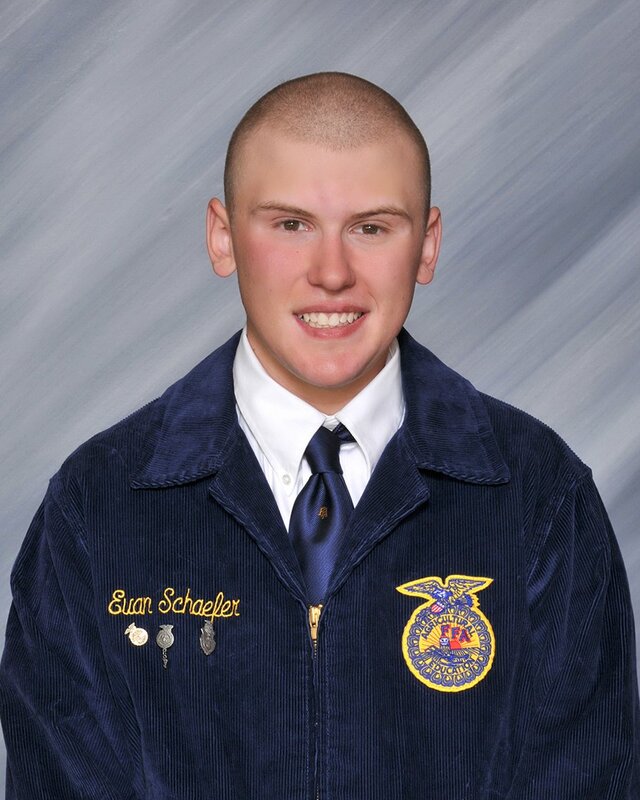 He placed 2nd in the nation at the National FFA Convention and Expo in Indianapolis this past month. Each of the top four finalists received a plaque and $500 courtesy of Tractor Supply Company. The West Holmes FFA chapter recently sent 9 members to Greenhand Camp at Camp Muskingum. Attendants were Zach Myers, Braiden Bower, Ethan Reining, Luke Shaum, Dylan Landon, Chase Stitzlein, Kayla Madison, Haley Crites, and Madison Stitzlein. The students arrived at 3pm for registration and dorm check-in. During this time they had free recreation. Here they could walk around camp and see what it’s all about. When registration was over, the staff and state officers welcomed the Greenhand members to camp. At 6:00 the members attended their first flag lowering and dinner. After dinner the members participated in field games. They played icebreaker games to learn each other’s names. At 8:00 they members had their first workshop. Here, the campers learned how to makes better decisions and thinking before they act. After the workshop the Greenhands participated in a scavenger hunt before going to campfire. By 11:00 campers were in bed resting for their next exciting day at camp. 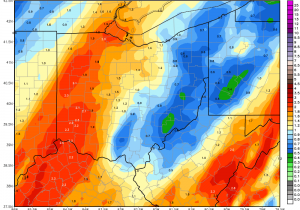 On a rainy day, the Hiland FFA Urban Soils Team participated in the District Soils Contests. 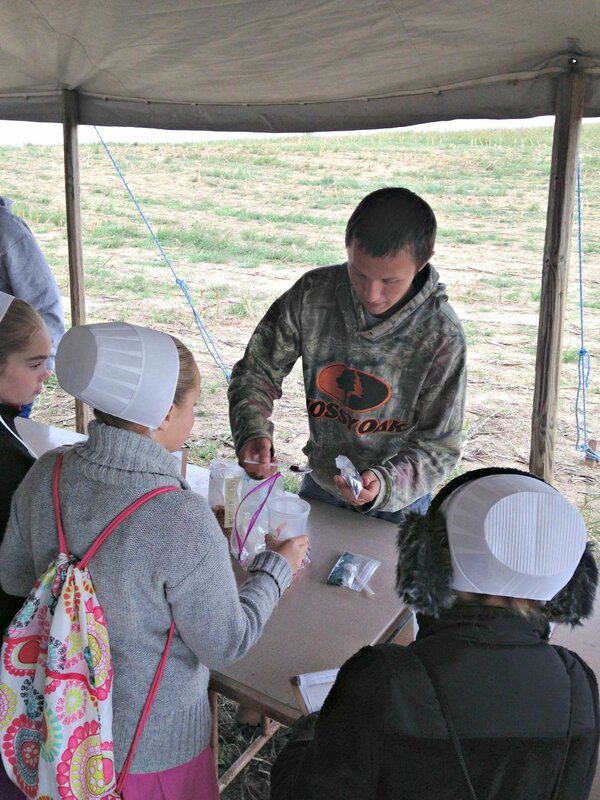 The District Soil Contest consisted of three pits, and two written test which was a soil survey test and a general knowledge test. The purpose of the urban soil contest is to see if the land can be used for nonfarm uses, buildings, or work sites. The members had to figure out the different soil types such as coarse, moderately coarse, medium, moderately fine, and fine. For horizon of the pit the students had to find soil layers like topsoil (soil near the top), subsoil (soil in the middle of the pit) or substratum (soil near the bottom of the pit). Also, the contestants had to find the slope by using the slope boards at one stake with another stake. There were 56 students who participated in this event as a district. 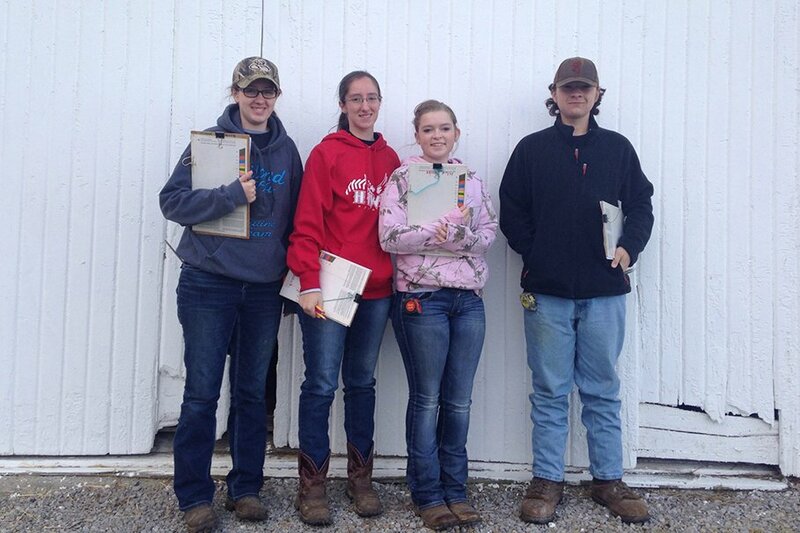 The Hiland Urban Soils Team placed 3rd at contest. This year, the Miami Trace/Great Oaks FFA had 6 graduate FFA members receive the American FFA Degree at the 89th National FFA Convention in Indianapolis, Indiana. This degree is bestowed upon a select group of students in recognition of their years of academic and professional excellence. This year there were a total of 3,780 American Degrees awarded. Those that received the American FFA degree from Miami Trace were: Jacob Rose, Natalie Miller, Cassidy Elam, Caleb Penwell, Evan Schaefer, and Heather Johnston. To be eligible, FFA members must have earned and productivity invested $10,000 through a supervised agricultural experience program in which they start, own or hold a professional position in an existing agricultural enterprise. Recipients must also complete 50 hours of community service and demonstrate outstanding leadership abilities and civic involvement. Each of the recipients received a gold American FFA Degree key, certificate and matted frame after being recognized on stage at the convention. The November 2016 Miami East-MVCTC FFA Members of the Month Kylie Blair and Jessica Gillum. 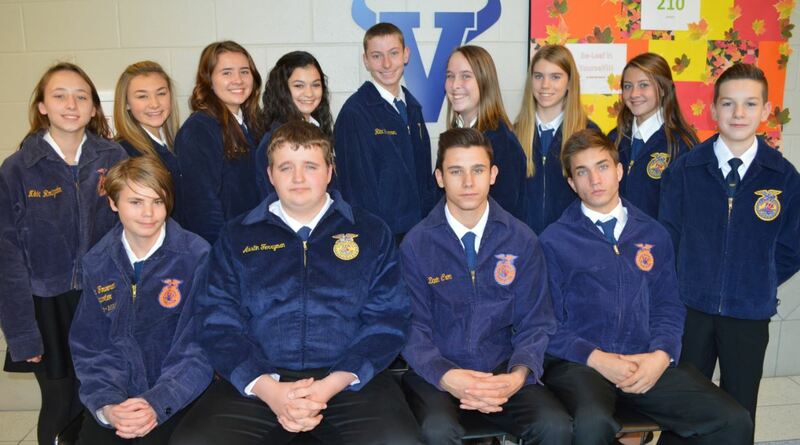 Both are sophomores and second years members of the Miami East-MVCTC FFA Chapter. Kylie is the daughter of Sonya Foster and Marty Blair. Jessica is the daughter of Kevin Gillum and Julie Kreiger. At the 2016 National FFA Convention Kylie and Jessica participated in the National Agriscience Fair with their Environmental Sciences/Natural Resources Systems project entitled, “Does Clean Water Mean Clean Soil? 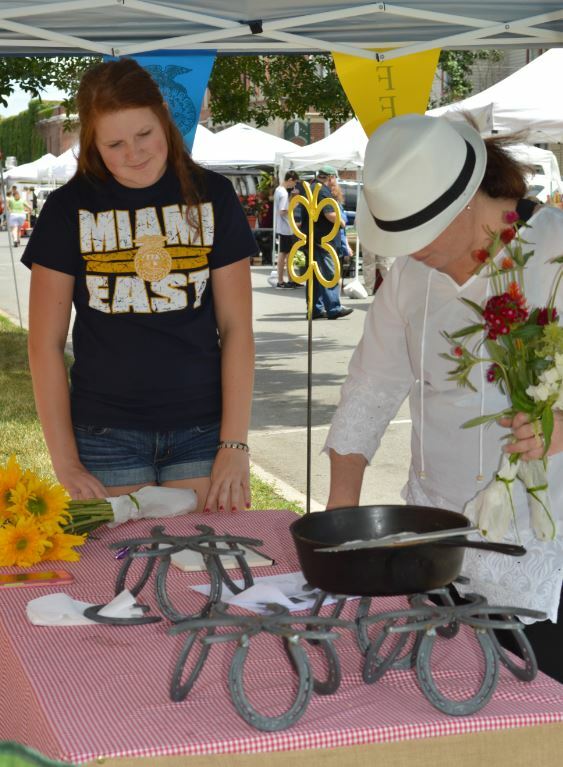 A Comparative Study of Townships In Miami County, Ohio.” The team qualified for the national competition after placing first in the state competition in May 2017. The team placed sixth in the nation and earned a gold rating. 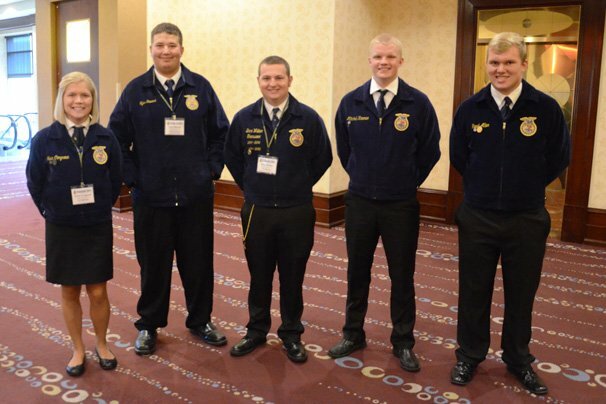 The 89th National FFA Convention and Expo was recently held in Indianapolis and, as usual, Ohio was well represented. Ohio FFA members earned 345 American FFA Degrees and there were many Agriscience Fair, Proficiency, and Chapter Award finalists. Ethan Kaper from Liberty Union won Plant Systems Division 1 in the Agriscience Fair, Evan Smith from Bloom Carroll finished third in the nation in extemporaneous public speaking and Sydney Snider rounded out her amazing year as a National Officer. Mariah Joy Cox of the Zane Trace FFA Chapter in Chillicothe has participated in science fairs since the fourth grade and found that she enjoyed the scientific research process and sharing her results with the judge. 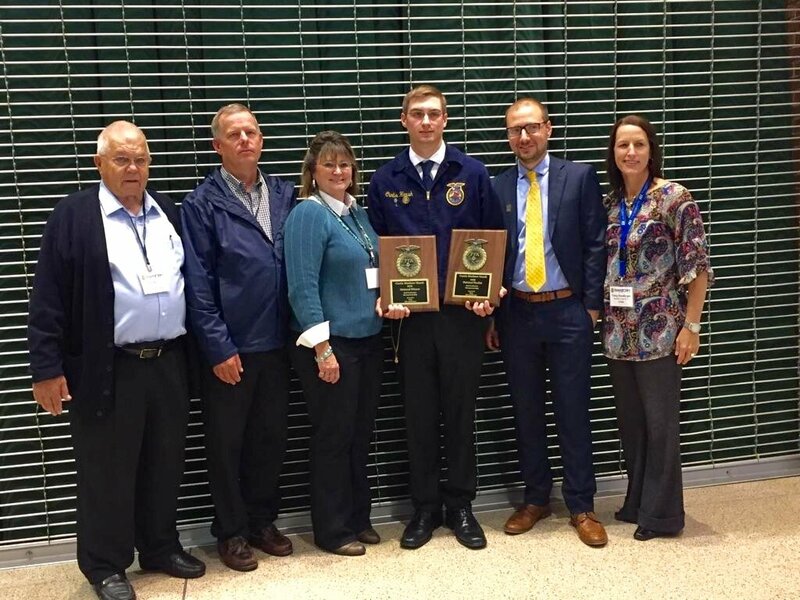 The 89th Annual National FFA Convention & Expo in Indianapolis, Indiana represents a new high water mark for the Buckeye Valley-DACC FFA Chapter. The chapter represented Ohio well with a National Proficiency Award winner, and a 3rd place Career Development Event team. Curtis Harsh of Radnor won the Beef Production Entrepreneurship proficiency area, coming out ahead of 3 other finalists from Missouri, Oklahoma, and Wisconsin. Harsh became eligible for the award after winning the Ohio state FFA competition earlier this year. To finish out his FFA career, Curtis was also awarded the organization’s highest honor of the American FFA Degree. Just prior to Curtis’ win, Buckeye Valley was pleased to learn that it’s Dairy Cattle Evaluation and Management team placed 3rd nationally, competing against teams from 40 other states. The team consisted of Macee Burke, Hannah Edelblute, Sarah Lehner, and Donnie Smith. In addition to placing 3rd overall, Buckeye Valley won the team management event, and had the 3rd high score individual with Sarah Lehner. “Transform: Purpose To Action” was the theme of this year’s National FFA Convention. 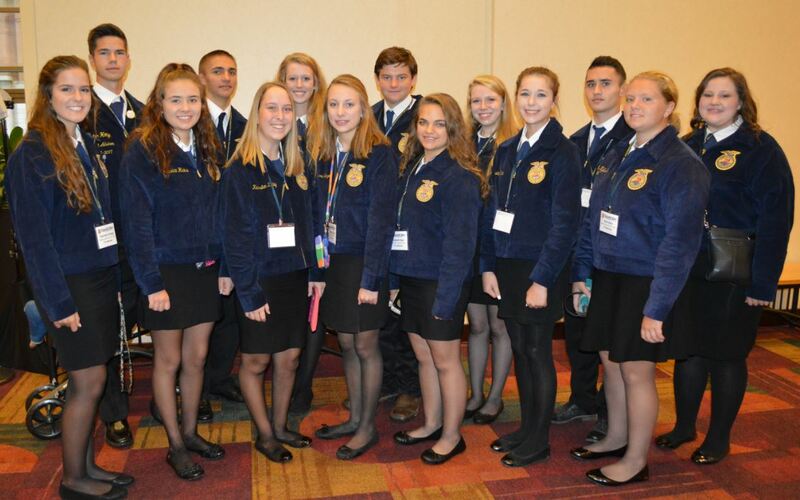 27 members of the Miami East-MVCTC and Milton-Union-MVCTC FFA chapters were in attendance at the convention in Indianapolis. 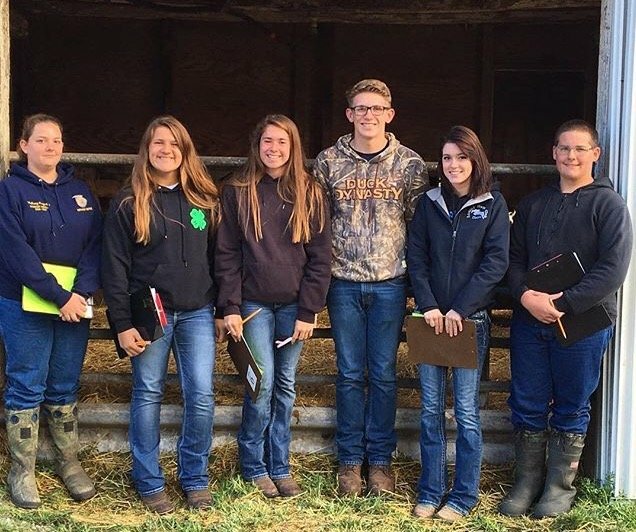 Those members included from Miami East-MVCTC FFA were Elizabeth Bair, Liza Bair, Ethin Bendickson, Kylie Blair, Keagan Carsey, Jessica Copeland, Luke Gilliland, Jessica Gillum, Jessica Hicks, Rachael Hodge, Weston Hodge, Savannah Holzen, Kearsten Kirby, and Abbey Koontz. From Milton-Union-MVCTC FFA were Daniel Albaugh, Destanie Brown, Joel Cress, Dylan Cross, Abby Hissong, Emily Hornberger, Jacob Hornberger, Webb Kress, Jessica Leffew, Eryn Oldham, Kamron Paulus, Liz Renner, and Rachel Thompson. Also joining the members during the trip was the Arcanum-MVCTC FFA Chapter and its members. More than 64,000 members, parents, and guests were in attendance at the National FFA Convention. Previous conventions were held in Kansas City, Missouri and Louisville, Kentucky. Convention activities included attending several convention sessions were members where inspired by motivational speakers such as the 2015-2016 National FFA Officers and motivational speakers author, and long-distance swimmer Diane Nyad, and retired NFL player and now farmer Jason Brown. On a brisk, cool morning the Hiland FFA Chapter went to the 5th Grade Farm Tour which was held at Spring Walk Farms in Big Prairie, Ohio. 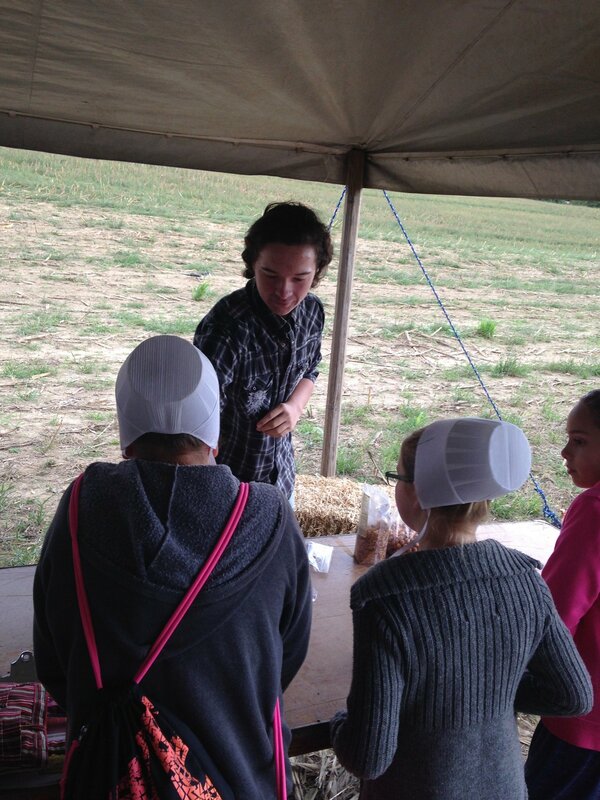 The Holmes Soil and Water Conservation District sponsored the 5th Grade Farm Tour. The 5th graders had a rotation throughout the day, stopping at various stations. Each stop was only 20 minutes long. When the tour was over the students went to eat lunch. The Hiland FFA members assisted with the soil station and helped the 5th graders make their own soil snacks to enjoy. The soil snack consisted of pretzel pieces represented bedrock, coco puffs were the subsoil, the granola represented the topsoil, raisins were the bugs, gummy worms represented the worms, and green sprinkles were the grass or crops. While the students were enjoying their snack, the Hiland FFA members talked to them about soil. There were nine FFA members that took part in this activity which were: Ethan Drzazga, Bailey Engstrom, Natalie Lovell, Hayleigh Scheufler, Parker Stutzman, Heidi Troyer, Sheila Troyer, Tallie Troyer, Cheryl Yoder, and Diane Yoder. Overall it was a very successful competition and our members look forward to competing in the future. Ohio was represented at the 89th National FFA Convention and Expo by 16 finalists in the National FFA Proficiency competition. The contest revolves around the work done through a Supervised Agricultural Experience, otherwise known as an SAE. We came across several of these finalists in Indianapolis. Watch the video below as several of them recap each of their projects and the work that’s gone into it so far. Mariah Joy Cox of the Zane Trace FFA Chapter in Chillicothe, Ohio, has participated in science fairs since the fourth grade and found that she enjoyed the scientific research process and sharing her results with the judges. Her SAE research has focused on three projects, all related to plant science. She first identified properties of potato starch and their applications to plant-based packaging. Secondly, she compared two varieties of raspberries in terms of phenolics and anthocyanins.